Welcome to your online resource for creative career change advice! What would it be like to jump out of bed every day - looking forward to the day ahead and excited about going to work? Imagine how it would feel to do work that utilized your talents and interests - every day. Would you like to live a more sane and productive life – without the commute? This website is all about eliminating the dreaded work week. You know what I’m talking about. You’re familiar with the Monday morning blues – that sinking feeling that starts sometime on Sunday when you think about the work week ahead and continues into Monday until you get yourself motivated to show up for work anyway. Or what about the familiar TGIF chant, celebrating the fact that you made it through another week? An achievement? Maybe. But it’s about survival, not happiness. Why spend your work week in misery when you can spend it in joy? You have a choice. And you don’t need to quit your job to get started. .... then this website is for you! 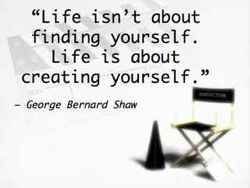 George Bernard Shaw said “Life isn’t about finding yourself. Life is about creating yourself”. This website was created with this philosophy. You can create a more fulfilling life and career. It’s never too late to get started. Why not start now? Free online career advice to help you explore career options and make a career choice that is right for you. Acknowledge your lost passions to create unique career change ideas. Do work that you love starting now. Get clear on your strengths and use them on the job to help get you on track to a successful career change. Use these life vision tools to imagine a clear picture of the life you want to live and help your dreams to become reality. Tips on places to look for business ideas, information and inspiration to help refine your business idea and get your career change underway. Here are 4 ways to find the courage to make your dreams a reality, to overcome your fears, get past the obstacles, and have the spirit to succeed anyway. Copyright 2008-2011 Creative Career Change. All rights reserved. No portion of this website may be reprinted without express permission.